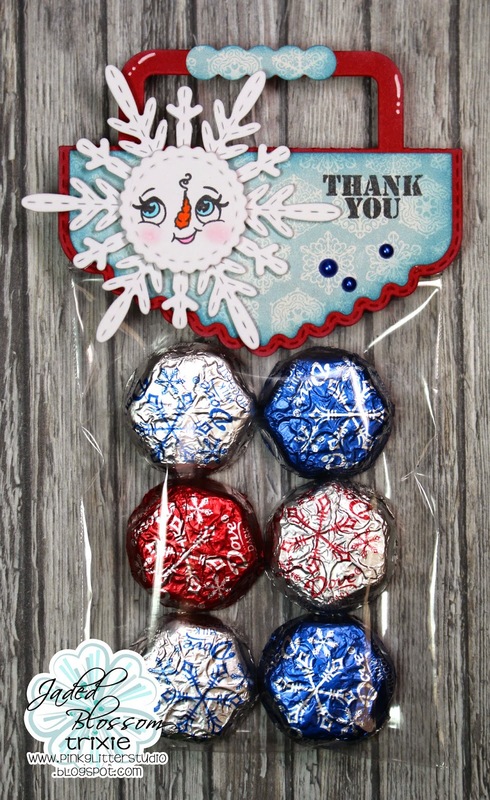 I made a cute little winter thank you treat. I used Jaded Blossom's Kind Thanks for the sentiment. LOVE LOVE that this set has so many different "Thank you" sayings!!! It's perfect! I also used Jaded Blossom's Dainty Topper Die, Winter Dies, Candy Charms and Banner Dies and 3x4 Clear Bags. I used the charm and stamped a Peach Keen's Happy Snow Couples Face Asst and then put it on top of one of the snowflake dies form Winter Dies. Added a few Doodlebug Pearls to the Topper. What a great idea. I love how the colors all coordinate with the treats! is really cute and fun!